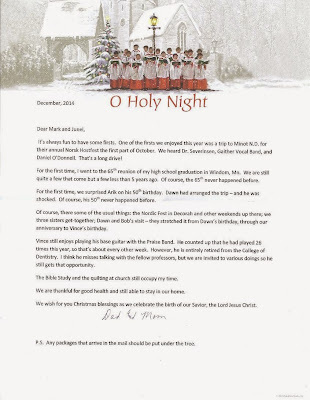 This blog contains copies of Christmas letters beginning in 1962 written by my mother, Verla (Blakey) Williams. They contain a wealth of family history and are included as a sidelight to the genealogy blogs listed in the blog roll. With some music on the FM for background and the sun shining in the window at 4333 Pine Ridge Trail I will try to remember some of the highlights of the year for Verla and me. She usually writes this letter and is so good at it that I feel that my attempt to take her place will end in total failure so if you will bear with me I will try to utter a few thoughts. Last Christmas we spent in San Antonio, TX with Dawn and her family, and Heather and Andrew with their families. Except both of us being ill on Dec. 24, 25, and 26 the time spent there was most enjoyable. Heather and Andrew had two young boys that kept things lively. Their weather in Dec. and Jan. is usually a bit more tolerable that what we are used to in Iowa. In July, Mark and Roslyn came to Decorah to see and participate in the annual Nordic Fest at the end of the month. Roslyn and Verla marched in the Parade of Flags that opened the Fest. Sharon, Verla's sister, and Verla each modeled a bunad, (folk costume) that she had acquired when she was in Norway years ago, to be in the Bunad Show in Decorah. Roslyn modeled a child's costume with Grandma and Sharon and of course they were all stunning to behold. Arik and Stacie and their three girls, Kaelyn, Amaya, and Lauren also decided to attend Nordic Fest this year. This was their 1st time at Nordic Fest and they said they had a blast and want to do it again next year. All that Norse food and music and dancing in the streets were really fun for them. They even danced a turn or two with Grandpa Vince on the street to a polka. They also explored all the haunts that Arik was used to when he was a kid growing up there. Then in Sept. Vince celebrated his 85th birthday, so Arik, Dawn and Bob, and John and Jene all were so kind as to come for a long weekend and help him realize that he is now considered one of the older old. A term we learned at a Senior College Course on "Mild Cognitive Decline and Dementia" which we just finished a week ago. If you are up there in age you need to know what they are talking about when they refer to you in a specific category. Before that I thought I was just getting older. So now Verla and I are at the peak of oldness. Verla continues her love of quilting with her Wed. group at Zion Luth. and I still play bass guitar in the praise band at Our Redeemer Luth. which give us much fun and camaraderie. In closing, Verla and I wish to give thanks to our gracious God and Savior for the many years that He has given us together and we wish all of you a Very Blessed Christmas and A Happy New Year. It doesn't seem possible that it is time to send Christmas cards again. My, how time flies (when you're having fun). We have had many enjoyable weeks or weekends throughout the year. We keep track of the days we are in Decorah, and it has been 40 some this year. So if there are 3 days in a weekend, that means about 12 weekends in Decorah. Most of them are just hanging out, eating at various restaurants, etc. In July, however, we spent the Nordic Fest weekend there. Mark and Roslyn had come to visit so they were with us, and Roslyn and I were in the Opening Festivities in front of the Court House and the parade of bunads (festive costumes) from the Scandinavian countries. I found in the cedar chest a child's bunad similar to mine which fit Roslyn. We also were in the Bunad Show on Saturday afternoon which is held in the Steyer Opera House. Arik and Stacie and their three girls (Kaelyn, Amaya, Lauren) visited us a week in August, and Dawn and Bob came to visit the first week in September. We enjoyed each of those visits. So for other activities: I take part in quilting every Wednesday at Zion putting quilts together–top, filler & back–and then they are tied and bound; the finished quilts are sent to Lutheran World Relief. I also make quilt tops at home from material given to me which has been donated to the church. And so the year goes by! Now we look forward to spending Christmas and New Year's with Dawn and Bob and family in San Antonio. We will meet great grandson Abraham (parents–Andrew and Samantha) whose first birthday was in October, and will reacquaint ourselves with great grandson Grayson (parents–Heather and Xav) who is about 9 months. Merry Christmas! For God so loved the world that He gave His only begotten Son that whosoever believes in Him shall not perish but have everlasting life! Christmas tree (Iowa City, IA, 2016). Image courtesy of Vincent Williams. Last year at this time we were in San Antonio with Dawn and Bob and their family for Christmas and New Year's; a marked difference from this year in Iowa City where it is snowing and the temp is dropping to below zero tonight. But you know what? We are alive and still kicking after all those years that God has allowed us to be on this earth. In March we returned to San Antonio to spend spring break with Arik, Stacie and the girls at Dawn's and Heather's. Their association has a pool so we spent some time relaxing at the pool. The girls, Kaelyn, Amaya, and Lauren are now a junior in high school, an 8th grader and a 6th grader respectively. They are really nice girls, but of course we are prejudiced. Of course, in April the infamous Blakey girls met in Decorah to spend a few days at the apartment and reminisce about times past and look into what's great about Decorah, and/or the area round about. July found all of our family here for a long weekend to help us celebrate our 60th wedding anniversary. Whoever would have thought that God would allow us to have so many years together. We are truly blessed with four children, eight grandchildren and two great grandchildren. The end of July found us back in Decorah for the annual Nordic Fest. Sharon showed up to help the celebration by wearing the bunad from North Osterdalen and Verla wore the one from Akershus in the bunad show. They behaved themselves and looked very stylish as they modeled the attire with great aplomb. Then we did something really different as we spent from Aug. 29-Sept. 1st at Mt. Carmel Bible Camp to celebrate the exact date of our marriage at the Bible Camp that Verla went to when she was a teenager. We had a great time and met some old friends of Verla's and made some new ones as well. Verla continues to lead a Bible study at church and then spends quality time with friends making quilts for Lutheran World Relief. Vince continues to play bass with the praise band at church and trying to keep up with the work that is involved with living on two acres of land. Hancher Auditorium was completed this fall so we have heard some wonderful musical and ballet events. May God continue to bless you all this Christmas Season and a Merry Christmas and Happy New Year to all. May you have a Blessed Christmas and a Happy New Year! It is difficult to know where to start - so many who are on my Christmas Card list are also on my e-mail list. So what I write here, you may have already read. We drove to northern Pennsylvania the end of May to see grandson Andrew and to meet his bride, Samantha; and of course to see the rest of the Boyd family. We won't be driving east to visit Dawn and Bob any more - they have moved to San Antonio, TX and live quite close to Heather and Xav. We plan to drive down to see them over the holidays. In June, we flew to Reno (Carson City) to visit Mark and family. He and Roslyn were in the show, Beauty and the Beast. Roslyn was the little cup with a chip. She's a budding actress. It was fun to see that. BrandiAnne graduated from the community college in Mason City in May, so we were up there to see her graduation. She is now enrolled at the University of Northern Iowa. And we have been to Traer a few times - in October for J.T. 's confirmation where we heard the best confirmation sermon ever. The Archbishop spoke directly to the “kids” and he had them listening! We were up there again for Thanksgiving and J.T. 's birthday, right on the day! And of course, several times to Decorah: Nordic Fest, etc. We've barely just begun to think about starting to go through files and drawers to see what should be given away or trashed or whatever. It was about August 1989 when we got a computer and printer and I wrote my weekly-or-so letter to the kids, sending each of them a copy. I found files of those copies I had made for me, too, the other day. I've started reading through them - wow! I think they go through 1998. Uffda! So that must have been when we started using e-mail. Something I have done is made a computer file of the letters I wrote from Norway the semester Vince spent there doing research. My sister Sharon had shared them with others but asked for them back and saved them for me. And just the other day, I found the diary I kept the summer the family spent on Anguilla, where Vince did some dentistry. There was no dentist on the island. Maybe I should publish? Anyway, have a blessed Christmas! Verla Williams. Christmas Letter (2014). Image courtesy of Mark D. Williams. It's always fun to have some firsts. One of the firsts we enjoyed this year was a trip to Minot, N.D. for their annual Norsk Hostfest the first part of October. We heard Dr. Severinsen, Gaither Vocal Band, and Daniel O'Donnell. That's a long drive! 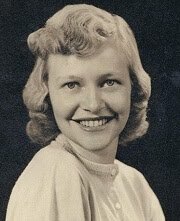 For the first time, I went to the 65th reunion of my high school graduation in Windom, Mn. We are still quite a few that come but a few less than 5 years ago. Of course, the 65th never happened before. For the first time, we surprised Arik on his 50th birthday. Dawn had arranged the trip - and he was shocked. Of course, his 50th never happened before. Of course, there some of the usual things: the Nordic Fest in Decorah and other weekends up there; we three sisters get-together; Dawn and Bob's visit - they stretched it from Dawn's birthday, through our anniversary to Vince's birthday. Vince still enjoys playing his base guitar with the Praise Band. He counted up that he had played 26 times this year, so that's about every other week. However, he is entirely retired from the College of Dentistry. I think he misses talking with the fellow professors, but we are invited to various doings so he still gets that opportunity. The Bible Study and the quilting at church still occupy my time. We are thankful for good health and still able to stay in our home. We wish for you Christmas blessings as we celebrate the birth of our Savior, the Lord Jesus Christ. P.S. Any packages that arrive in the mail should be put under the tree. Another year has gone by and it's been a good one! We are both in good health, just a little slower, just sit a little more, just nap a little more. Vince has officially re-retired. He has gone in one day a week as an adjunct professor for about 15 years but decided now was the time to quit. There seems to be enough jobs around here to keep him busy. We still keep our apartment in Decorah (we go north for the summer) though we did move. An apartment across the way from ours became available so we took that one. It is a 2 bedroom so we now have room for guests. Come see us. There have been a few trips this year. The most memorable one was to celebrate Vince's 80th birthday. We gathered the whole family for a week in July at a light house keeper's cottage that has been restored and is rented out by the Calvert County, MD, Museum. It is right on Chesapeake Bay - the light house is still in operation, but not the keeper's cottage. It can be divided in half, so 2 unrelated families can use or it can be opened up. It holds 14; we were 19, but lucky for us, Dawn lives about 20 minutes from there so they drove down each day. The times to have everyone free to get together are not very often, so it is extra special when it happens. Other trips: twice to Mankato, for 'family reunions' - once the usual end of June and the second in July when brother Gordon was there from Denver. A trip to the Maryland area in the spring to see Heather receive her promotion to Lt. Commander- yes, she still is in the Navy and stationed at Fort Belvoir Army Hospital. We went to Hayward, Wl for a visit with a colleague at his cabin on the lake. He says we can use it anytime. Oh, and to Carson City to visit 6 year old Roslyn and while we were there we watched Mark play the part of Javert in Les Miz at their Community College. We have also had visitors: Dawn and Bob from Maryland, Sharon, Jessica and boys from Mpls. and Duluth, Karlene and Ed Krisker from Minnesota seeking Roe family info--our 4x great grandfathers were brothers; Pam and Tom with Sharon and Dalen, Steve and Kathy from Denver. Not all at the same time, you understand. Vince plays once or twice a month in the praise band at Our Redeemer. He bought himself an acoustic bass guitar last fall. I keep busy with LWR quilting and Bible study. And I mentioned Mark's daughter, Roslyn - she is in first grade. Then Arik's: Kaelyn is 13, in 8th grade; Amaya is 10, soon to be 11 and in 5th grade and Lauren is 8 and in 3rd grade. Jené's are BrandiAnne who graduated from high school and is first year in the Community College at Mason City; J.T. just had his 16th birthday - now he can drive alone. We wish for you Christmas blessings as we celebrate the birth of our Savior, Jesus Christ. Pioneer Certificate. 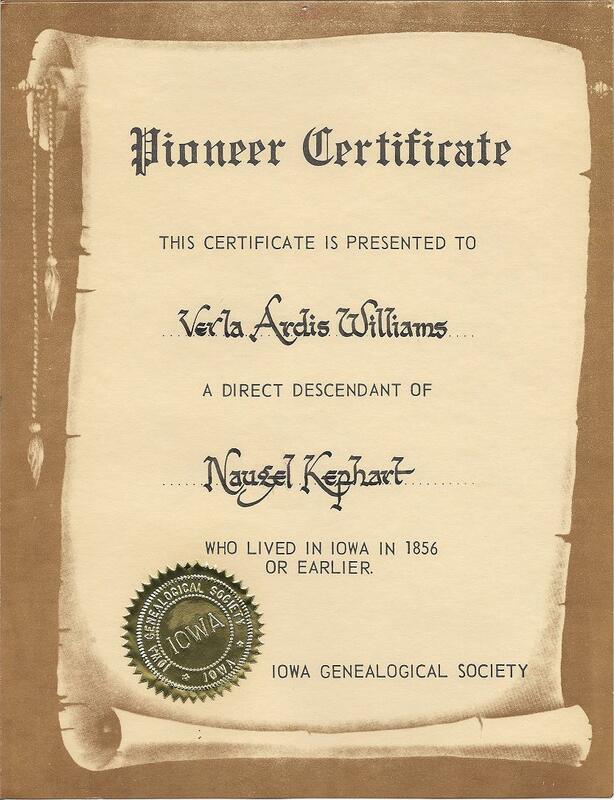 Iowa Genealogical Society. Image courtesy of Verla Williams. who lived in Iowa in 1856 or earlier. It might be possible to copy last year's letter and you wouldn't know the difference. It seems we keep doing the same things year after year. Vince is still the prosthodontics consultant one day a week at the College; I still have Bible Study and LWR Quilting spring and fall. We go to concerts by the Cedar Rapids Symphony (now calling themselves Orchestra Iowa) about once a month, and also Bank bus tours a couple of times a year. We saw the musical Miracle on 34th Street in the Quad Cities earlier and also The Nutcracker last week at the restored Paramount Theater in Cedar Rapids. It had been badly damaged in the 2008 flood. We went out to see Dawn, Bob, and Andrew part of spring break in March, partly to celebrate with Andy his graduation from college and obtaining a good job. I don't know what he does - he's a computer scientist. Way beyond my understanding. We also got to see Heather and Xav - yes, they are back in the states. Heather is stationed at Fort Belvoir, VA so lives only about an hour from her folks. We 'helped' them get settled in their apartment - the shipment from Japan had arrived. Well, I mostly sat up in the loft holding their small dog, to keep the dog from getting stepped on and getting squashed. And in August we took a short trip to Oregon to see Arik and Stacie, Kaelyn, Amaya and Lauren. My, how they grow up with each passing year. We didn't make it out to Nevada this year, but we have skyped with Roslyn. She is SO excited because she is in the performance by a children's theater group of The Little Mermaid Jr. They performed for three weekends. Is it like father, like daughter? We do see the Daubs oftener- sometimes for a cross country meet, or a track and field meet, or even a foot ball game. BrandiAnne is a senior this year, J. T. will be a sophomore, active in football and wrestling. The Blakey "girls" try to get together in Decorah once a year and we did that in August, too. And we also try to have a family reunion in June and at Christmas time. The one in June has been at Decorah, also - it is sort of central. We are both well- walk a little slower, sit a little longer, but still manage the upkeep on the house and the yard. I heard a fellow the other day say he belongs to the useta club - I don't know how many usetas one needs to join - he useta ride bike, he useta golf. Oh yeah, the kids all thought they should come home the last weekend in April. It was a surprise to me! Dawn and Bob come every once in a while, so that was okay. But when Mark walked in, then I knew some planning had been done behind my back. And I got suspicious and asked if Arik was coming, too. Dawn couldn't lie, and said he was - the next day. (He was disappointed that he wasn't a surprise, too). Jene had me faked out because they had been with us the previous weekend (part of the ruse). It was something about a significant milestone in my life. We had a good time - Dawn plans well. God's blessing be yours as we celebrate the birth of Jesus! It doesn't seem possible that it could be December already - time just seems to go faster and faster, and I go slower and slower. We do much the same things month after month: Vince still works one day a week, (he is already being asked to work next year), I still have Bible Study and LWR quilting spring and fall. We like to go to the concerts by the Cedar Rapids Symphony and also on Bank bus tours (we went to both "Simply Sinatra" and the "Nuncrackers" earlier this month). We get up to Traer for Track or Cross Country meets a couple of times to watch BrandiAnne run. She is a long-distance runner and good at it. We were with the Daubs for Thanksgiving - helped JT celebrate his 14th birthday - time does fly, doesn't it? There were also a couple of longer trips. We spent part of Holy Week and Easter with Dawn and Bob and Andy in the spring; and a week with Arik and Stacie and girls in August at a rented house on Priest Lake in northern Idaho. It is always fun to visit each of them. There was also a couple of weekend when we had visitors - Steve (Vince's nephew) and Kathy one weekend, and my sisters, Sharon and Pam and their spouses, another weekend. That's fun, too! And just last month, we flew out to Carson City to visit Mark and Junel and Roslyn, and incidentally to see Phantom of the Opera with Mark having the lead role. My sister Sharon and our daughter Dawn joined us for that long weekend. It was fun and Mark did a great job. Heather and Xav will be coming back to the states in February - she ends her tour of duty in Japan. It will be so much easier to visit them. We did just finish a little upgrading in our house. The floor covering in the laundry room was the old rubber backed carpet that was used 35 years ago - we had it replaced with sheet vinyl. And this past week, the carpet in the kitchen was replaced with oak flooring, plus a new counter top and sink. Now, we will enjoy it for awhile until we decide that it's time to downsize, and then it will probably be more sellable. We are both well- just a little more creaking and cracking in the joints and bones. But we are thankful for good health. May the blessings of Christ's birth be yours this Christmas season! Verla Williams holding the crystal bowl she was awarded for her devoted volunteer service. Images courtesy of Vincent Williams. 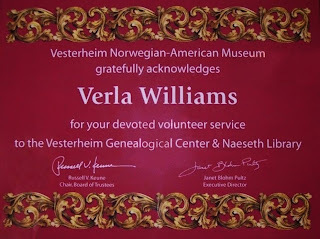 Tonight I am pleased and honored to present a special Vesterheim heritage award to Verla Williams for her devoted volunteer service to the Vesterheim Genealogical Center & Naeseth Library. For over 25 years Verla has sat at an electric typewriter in her home in Iowa City, where she has typed somewhere in the neighborhood of 80,000 index cards containing the names of Norwegian immigrants. Beginning in January 1981 with a list of emigrants from Holla, Telemark, Verla worked her way into much larger projects including the complete list of Norwegians in the 1900 Iowa census, followed by the 1900 Minnesota census. In 1900 there were 11,000 native born Norwegians in Hennepin County alone! Verla is the Genealoqical Center's longest serving volunteer, and the census indexes she created have helped countless people find information on their family histories. Blaine Hedberg, who is the Naeseth Chair of the Vesterheim Genealogical Center, is unable to be here with us tonight, but says this about Verla Williams: "I wish we had a way to duplicate Verla; she has really been vital to the resources at the center. . . . Researchers for generations will be talking about her efforts to document the Norwegians in Iowa and Minnesota. When I think of Verla, I think of extreme persistence and dedication. Please extend my greetings and thanks to Verla for all the wonderful help she has given over the past years." Verla, on behalf of the trustees, staff, members, and friends of Vesterheim, I present you with this small token of our appreciation for persistence and dedication. Thank you. "Volunteer Corner," Norwegian Tracks 34/1 (Fall 2009), p. 5. 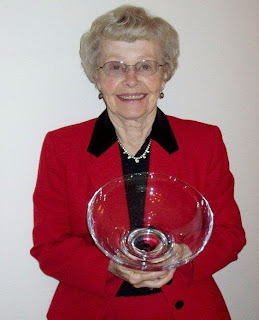 Verla Williams of Iowa City, Iowa, has won the distinction of being the Norwegian American Genealogical Center and Naeseth Library's longest-serving volunteer. 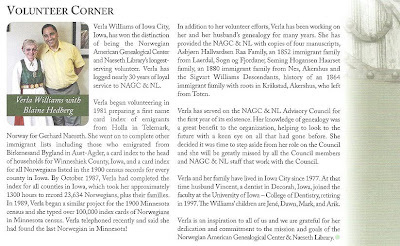 Verla has logged nearly 30 years of loyal service to NAGC & NL. Verla began volunteering in 1981 preparing a first name card index of emigrants from Holla in Telemark, Norway for Gerhard Naeseth. She went on to complete other immigrant lists including those who emigrated from Birkenes and Bygland in Aust-Agder, a card index to the head of households for Winneshiek County, Iowa, and a card index for all Norwegians listed in the 1900 census records for every county in Iowa. 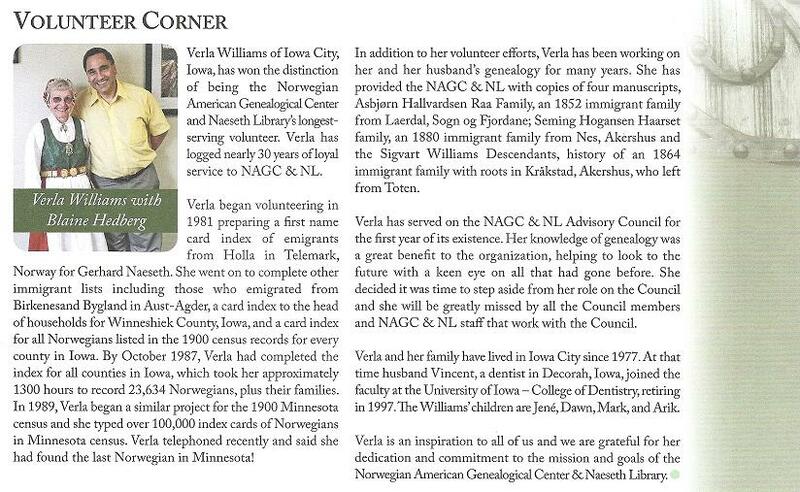 By October 1987, Verla had completed the index for all counties in Iowa, which took her approximately 1300 hours to record 23,634 Norwegians, plus their families. In 1989, Verla began a similar project for the 1900 Minnesota census and she typed over 100,000 index cards of Norwegians in Minnesota census. 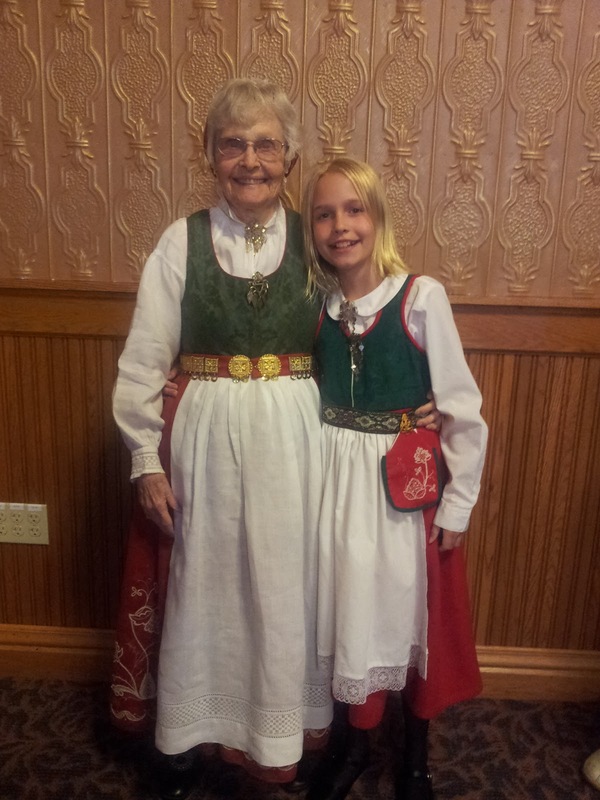 Verla telephoned recently and said she had found the last Norwegian in Minnesota! In addition to her volunteer efforts, Verla has been working on her and her husband's genealogy for many years. She has provided the NAGC & NL with copies of four manuscripts, Asbjørn Hallvardsen Raa Family, an 1852 immigrant family from Laerdal, Sogn og Fjordane; Seming Hogansen Haarset family, an 1880 immigrant family from Nes, Akershus and the Sigvart Williams Descendants, history of an 1864 immigrant family with roots in Kråkstad, Akershus, who left from Toten. Verla has served on the NAGC & NL Advisory Council for the first year of its existence. Her knowledge of genealogy was a great benefit to the organization, helping to look to the future with a keen eye on all that had gone before. She decided it was time to step aside from her role on the Council and she will be greatly missed by all the Council members and NAGC & NL staff that work with the Council. Verla and her family have lived in Iowa City since 1977. At that time husband Vincent, a dentist in Decorah, Iowa, joined the faculty at the University of Iowa - College of Dentistry, retiring in 1997. The Williams' children are Jené, Dawn, Mark, and Arik. 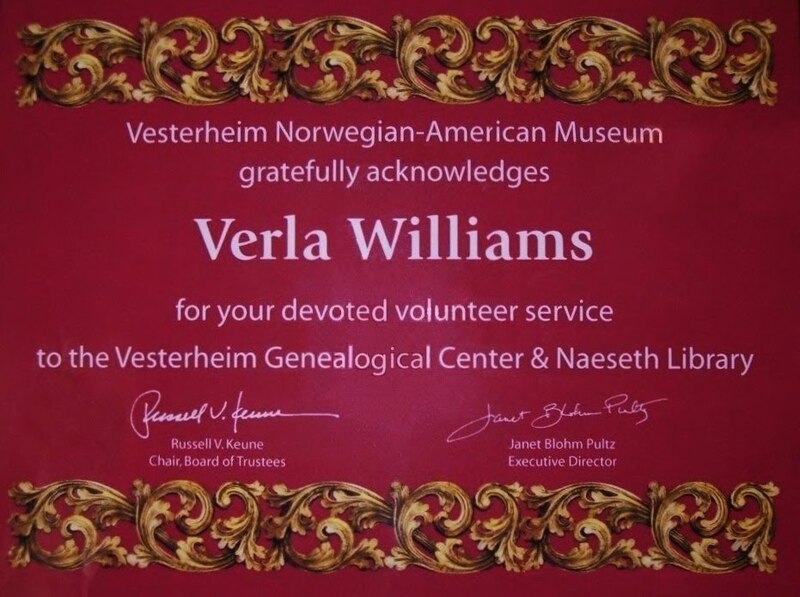 Verla is an inspiration to all of us and we are grateful for her dedication and commitment to the mission and goals of the Norwegian American Genealogical Center & Naeseth Library. Copyright © Mom's Christmas Letters. All rights reserved.